Today was just that way. worn out cowboy boots?? ?....those are the best kind ! that's a great way for a day. love this photo. 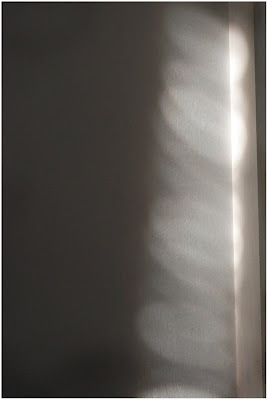 i've taken similar shots of light created through my blinds. was that where your light formation came from too? Georgia - I think the blinds were up . . . nope. You're right. Only one set was up; I think the light was coming through the side edges of the closed blinds? How funny that I'm unsure. Lordy. Getting old. "How funny that I'm unsure. Lordy. Getting old." Does "women of a certain age" come to mind?? Ha!! Love your short list and worn out boots are the best (as is 4WD - you are so right). I wish i still had my old ostrich skin cowboy boots from college. Sounds like the best kind of day!!! It DOES sound like the best kind of day...noticing the simple things in life. Beautiful simplicity. The lights on your wall look like a giant vertical feather.